Iranian President Mahmoud Ahmadinejad has courted further controversy by explicitly calling the Nazi Holocaust of European Jewry a "myth". "They have created a myth today that they call the massacre of Jews and they consider it a principle above God, religions and the prophets," he said. On live TV, he called for Europe or North America - even Alaska - to host a Jewish state, not the Middle East. Israel swiftly denounced the president's comments. "We hope these extremist comments... will make the international community open its eyes and abandon any illusions about this regime," foreign ministry spokesman Mark Regev told AFP news agency. Mr Ahmadinejad's latest declaration echoes comments he made last week, in which he said territory should be "provided" in Germany or Austria to establish Israel "if European countries claim that they have killed Jews in World War II". The president sparked international outrage in October when he said Israel should be "wiped off the map". Speaking to thousands of people in the south-eastern city of Zahedan, Mr Ahmadinejad brushed aside criticism of his views, saying it was orchestrated by supporters of Israel. He returned to his earlier theme that Europe should shoulder the responsibility for a Jewish state. "If you [Europeans] committed this big crime, then why should the oppressed Palestinian nation pay the price? "This is our proposal: give a part of your own land in Europe, the US, Canada or Alaska to them so that the Jews can establish their country," he said. Since his election in June 2005, Mr Ahmadinejad has taken a more hardline stance towards Israel in public than his predecessors, and has recently stepped up his anti-Israel rhetoric. Israel's spokesman said the Iranian president's latest remarks reflected a "perverse vision of the world held by this regime". BBC Tehran correspondent Frances Harrison says the Iranian press has endorsed the president's views, calling them logical and less passive than the approach of previous Iranian governments. The foreign minister of Germany criticised Mr Ahmadinejad's remarks as "shocking and unacceptable" and warned they could influence negotiations with Iran over its nuclear programme. "I cannot hide the fact that this weighs on bilateral relations and on the chances for the negotiation process," Frank-Walter Steinmeier said. German officials are scheduled to meet their Iranian counterparts on 21 December for the next round of talks over Iran's nuclear ambitions. Talks between Tehran and three European Union nations - Germany, France and the UK - have been deadlocked over Iran's renewed efforts to produce nuclear fuel. 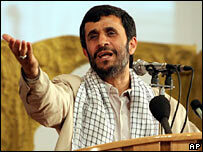 The EU renewed its condemnation of Mr Ahmadinejad's position, saying it had no place in civilised political debate.